Before you get into a survival situation I'm sure you want to be prepared, which is kind of why you landed on this article right? 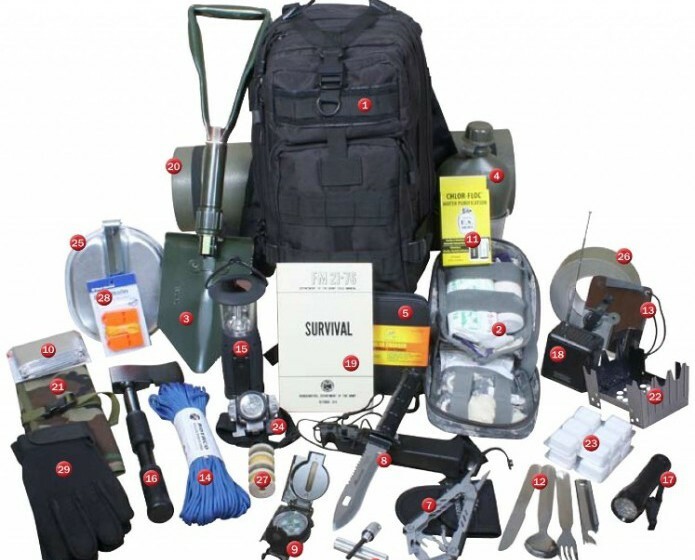 You want to know the 8 items to have on a budget with you when faced with a survival situation that will all but guarantee your safety and survival. With minimal interaction with bears of course. And that is what we aim to give you! In this article we'll break down the items you'll need, as well as why these particular items were selected for those on a budget. So strap in and let's get down to business! We wanted to make sure you had everything you needed and nothing that would weigh you down. That's why you might notice that a few of these items are multipurpose, this will conserve space and still give you all the tools you need to survive. ​And we're assuming here that you're willing to do what it takes to survive, in particular, killing something to get some food. This is the hardest part of survival for some, but it's a necessary evil. Otherwise we would have just suggested you get some protein bars and survive on that. But there's no telling how your body will react to that food after a period of time, so it's better to be safe than sorry. When it comes to selecting the best survival items for a tight budget you need to balance the quality of your stuff with the price. And since you usually get what you pay for you want to look for the producers who are putting on stellar deals! Some of these items might not be the best choice for you, and some you might not be able to live without. It's up to you to determine your situation and what you deem necessary to have for a survival situation. ​When we say your geographic location, we're mainly focused on the type of area you're living in. Is it wooded, grassy, tundra, or desert? All of these are going to factor in as to what should be on your personal survival list. 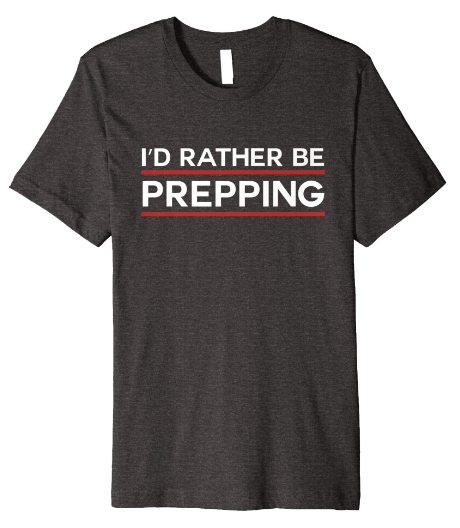 ​We would like to emphasize that our site is geared mostly toward the desk jockey and not the survivalist extraordinaire. So we made this list assuming that the person using it is pretty inexperienced in the ways of surviving in the bush. But if you're someone who spends many a night underneath the stars with nothing more than a tin can and your pocket knife, then that's all you'll probably need. However if you're someone who's used to being a fully domesticated home dweller, you're going to want everything on this list and then some! It would do you well actually to get out into the wild a few times to make sure you've got the mental capacity to handle it every once in awhile. ​You might notice there's no water filter on the list, and that's to send a message. You should ALWAYS have a water filter of some kind with you, whether it's a filter made with what's around you, or one you can buy at the store, like a survival straw. If there's one resource you're lacking that can slow you down in a matter of hours it's water, and if you get dirty water it's worse than not having any at all. Which is why we recommend keeping a personal water filter/straw with you on every outdoor adventure whether it's for survival or not. It just makes sense to keep something like this with you when you're outside for long periods of time, because you never know how fast or how much water you'll go through in a given situation. And what's even more amazing is that this product has been tested at Intertek Labs in Columbus Ohio to show 99.9% filtration removal (Highest Certifiable Level) for tested VIRUS, STAPH and BACTERIA. The triple Filtration to 0.05 microns, thanks to UF Filtration, Carbon Filtration and mesh - 4 times more efficient than the competition at 0.2 microns. This handy (pun intended) tool is going to be the most obvious. Unless you like weaving together grass or reeds to make cordage, having about 80 feet of durable paracord on your wrist is a better idea. And the fact that it's free + shipping makes it even better if you're on a budget! The bracelet from survival life is a pretty great deal. You get a paracord bracelet, flint and steel, and rescue whistle all in one handy (again, pun intended) package. Matches, no matter how weather proof, can splinter and break. Survival candles can literally melt away if heated or damaged. lighters can be fickle and not the most reliable in a pinch with wind and harsh weather. But the trusty kinetic reaction of flint and steel is about as reliable as the sun setting in the west and rising in the east! Having a flint and steel at all times is a great idea just like having a water filter is, and the fact that Gerber makes one that fits comfortably around your neck makes life a little easier. What's better than having a shovel to help dig?? How about one that can also cut, chop, and stab? That's why we recommend the multipurpose shovel for anyone needing to survive on a budget. Now this is one of the most useful things we've seen in a long time! 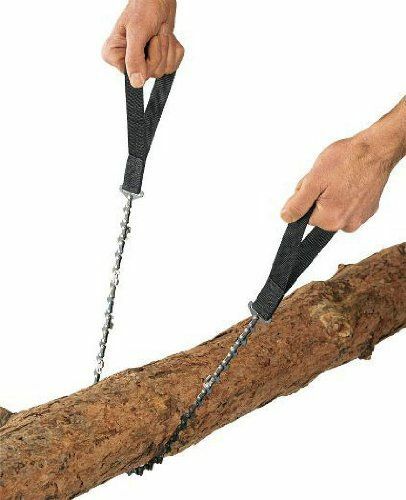 The pocket chainsaw does exactly what the name suggests and gives you the ability to bring down substantial pieces of timber with minimal effort. 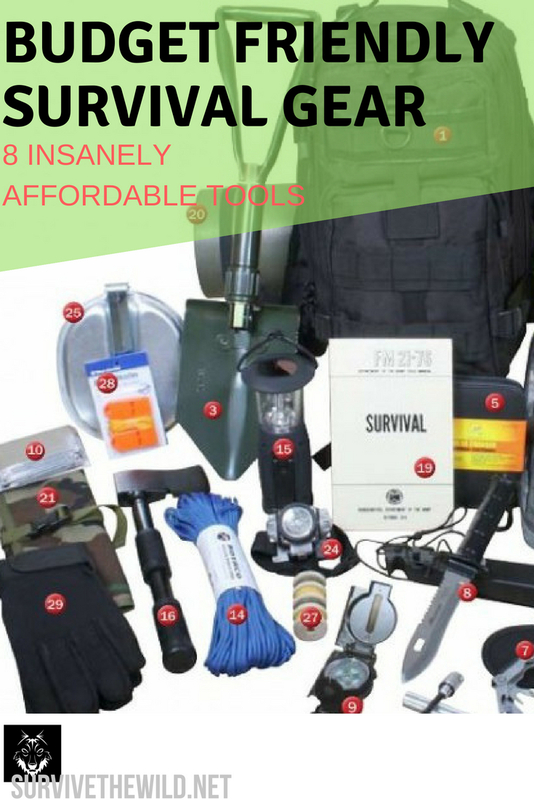 If the multi purpose shovel is a bit out of your price range, or you don't think it's the most practical survival item for you and your budget then you should take a look at this nifty tool. at just over a foot long, and with hundreds of sharp teeth, the pocket chainsaw is an effective tool. Another free+shipping tool from survival life, the edt multitool is quite effective at being the best pocket tool around! With a knife, screwdriver, can opener, pliers, and wire cutters this thing can do just about anything you need. And the fact that this tool that would normally be sold at retail for $20 is free is a phenomenal deal! It's one thing to enjoy yourself sleeping under the stars in a dry warm climate, but it's another to try to enjoy that same feeling in the tundra. So make sure you're prepared for both situations with a quality compact mylar sleeping bag. Some of you might be able to guide yourselves through the world by looking at the stars or positions of the sun, but not everyone is that lucky. Or maybe there's cloud coverage and you can't see the sun, but you need to make a decision about which way you need to go, that sounds like a pretty good time to have a compass just in case. And it doesn't get much better than using a military grade compass to get your sense of direction back. Also the durability of this compass will come in most handy when your having to rough it through some pretty tough travels. Now all the stuff we've talked about is pretty great to have, but if you're planning on carrying these items around in your tactical pants or parachute pants then things might get a bit rough. What are you going to do if one of those pockets rips or falls apart? Which is why we recommend a lightweight survival pack to stash all your stuff in and keep it protected. Your legs will thank you for not having all that stuff bounce around in your pockets and potentially cutting up your legs.